A twin-tail, pusher plane meant for military service. Yes, those insignia are crosses, but whose? And when? Beautiful candy-stripe coloration on the twin-booms! Popular with its pilots, but not many built. 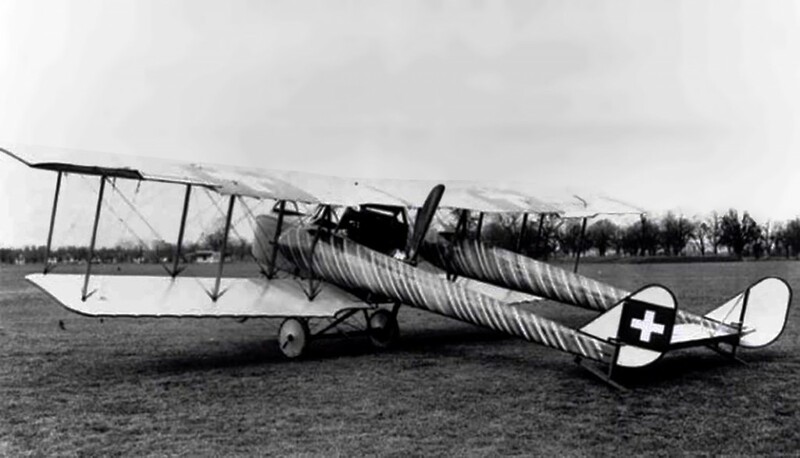 AGO C I 1915. Swiss military ? This is a Hafeli DH1 1910 Swiss tandem, 2 seat reconnaissance aircraft. Six were built in 1916 by the aircraft department of the Federal Construction Works (Eidgenoessische Konstruktionswerkstaette, K+W) at Thun, Switzerland. Three were destroyed in accidents within a year and the remaining three were scrapped in 1919. Length 28ft 11 1/4 inches, W/s 42 feet, Ht 9 ft 10 inches. 78 m.p.h, Range 155 miles, Ceiling 9,840 ft.
Powered by an Argus As 2 engine. Carried a single 7.45mm ( 10.293 inches ) machine gun. Not being familiar with the Swiss Haefeli, to me it looks like an AGO C.I with Swiss Markings. Was the AGO copied by the Swiss or was a Haefeli copied by the Germans in 1915?